Modern engagement ring with a double pave setting -- two rows of sparkling pave diamonds accent the band and add additional decoration to the center diamond. A ring for a strong, stylish woman who likes unique designs. A beautiful heart-shaped frame with pave diamonds surrounds your center diamond while the 14k white gold band is split apart with pave diamonds on both sides. A very stunning, unique engagement ring that will impress all within eyesight! This is a basic pave engagement ring -- almost as simple as a solitaire ring, but with pave diamonds that add additional sparkle and flair. Beautiful ring with tons of details to make it sparkle from every angle. 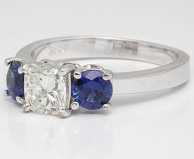 Add beautiful blue accents to your engagement ring with blue sapphire side stones on either side of your center diamond. Each of the three stones is carefully secured to the 18k white gold band with a wire basket setting. 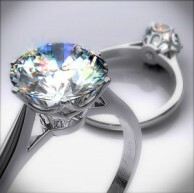 You can choose a round, princess, emerald, or radiant cut diamond for your center diamond. 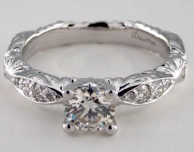 The intricate details are what make this ring amazing. This very unique engagement ring has a decorated band with a carved design and a very unique pave setting. On each side, four pave diamonds, cascading in size, are embedded together, then a single pave diamond sits lower on the band. 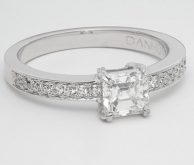 This ring can be set with a round or princess cut diamond. 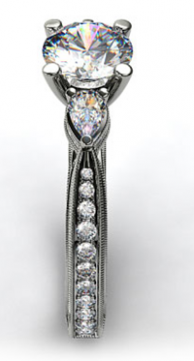 Dazzling spiraling tension set engagement ring in 14k white gold. 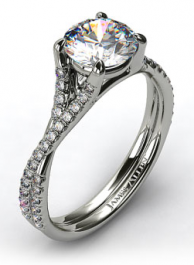 This beautiful engagement ring is a modern style stunner with an artsy feel to it as well. Definitely a unique look! 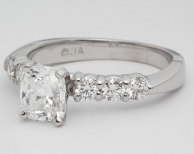 Shown here with a round diamond, but this ring can also be set with a princess-cut diamond as well -- your choice! Beautiful, colorful ring with sapphire sidestones. This engagement ring features 3 channel-set diamonds on either side of your center diamond, which is set in a cathedral-style cross-prong basket so that you will be able to admire your diamond from all angles. You choose a round diamond for the center, or, for an extra $150, you can choose a fancy shape diamond instead. 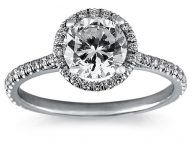 This setting is a beautiful combination of styles that creates a stunning engagement ring. 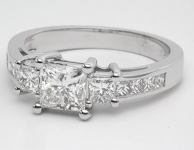 The 14k white gold band splits apart as it reaches the center diamond, and has pave diamonds embedded on both sides. 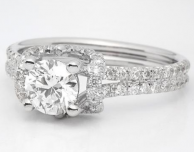 The center diamond of your choosing will also be flanked by two side stones on either side. 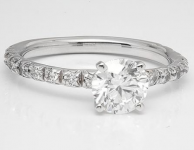 This ring must be set with a round diamond in the center. This setting has a beautiful, interesting "twist" (get it???) on the traditional pave setting. 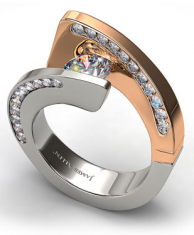 The band on this ring is split into two smaller coils with pave diamonds that cross over each other as they reach the top with the center diamond.